INDIANAPOLIS–Shen Yun Performing Arts Touring Company presented a matinee performance in Indianapolis at on Jan. 17. Among the audience members were Martin and Annette Jones, who thoroughly enjoyed what they saw. Shen Yun is a one-of-a-kind performance, showcasing the traditions of 5,000 years of divinely inspired Chinese civilization. 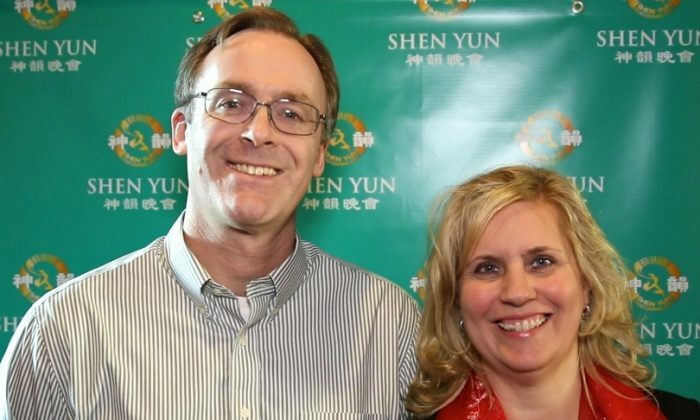 This ancient culture placed an emphasis on spirituality and moral values, according to the Shen Yun website. Classical Chinese dance gives life to these traditions, values, and spirituality by depicting beloved myths, legends, historical characters, and past and present events in China. “We very much like the dance, costumes, and expressions of the dancers,” said Mrs. Jones, a local elementary school principal. The dancers and musicians train all year for Shen Yun’s tours. The performers are considered some of the best in the world. Audience members often comment on the energy of the performance. “I think it’s exciting and has a wonderful and great energy to it!” said Ms. Jones. “We were just surprised at the expressions of the dancers, and how much the orchestra added to the dance,” explained Mrs. Jones. Shen Yun’s orchestra is unique in that it blends both Western and Eastern instruments.